Yeah, so, I’d say that pretty much, when it comes to the hobbies and things, I’m covered. Which is why I’m resisting adding archery back to the list. And dancing. And Renaissance fairs. And…well. The list, it goes on. And on, and on, and on, and on. So yesterday, I found myself staring at a wad of undyed lace weight yarn (and a few of its cousins) I’d just pulled out from under the bed while looking for something else and thinking, yawn. Boring. White. Meh. I wanted enough Plain White for one (1) shawl, but I did that thing where you forget what you already have and I bought enough Plain White for one (1) shawl…about twelve times over the last year and a half. Gah. And then I thought…well, I thought adding some color would be nice. I’ve never dyed yarn before. 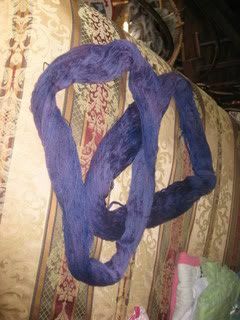 I’ve dyed fabric plenty of times (a great way to dress up a sadly faded but still awesome shirt or dress from the thrift store is to over-dye it), but never yarn. This is mostly because there are so many others who pretty much keep my need for fascinating colors covered. Set the mixed up dye aside to think about things (what does dye think about while ‘resting’ I wonder…also, what has it got to rest from, exactly? Does it wonder how this idiot is planning to misuse it? Or does it excitedly plan a life for itself where it will be added to boring white laceweight yarn and become something glamorous and be worn to the White House to meet the First Lady, who will swoon over it and then it will live in the White House because its owner will be made Chief Dyer of Glamorous Laceweight to the First Lady and the Denizens will get to play on the new swingset with the Obama girls who I totally think would be a good influence on my Denizens because hello, they are not afraid of Weather?) while I got out the ‘crock pot of dubious lineage’ for dyeing. This is the same crock pot I use to melt the glycerin when I’m making soap, and to melt the wax when I’m dipping candles. Because LORD KNOWS I can’t just go to the store like a normal person when I need soap or candles. HAHAHAHAHA, ‘tis to laugh! No! That would be simple and possibly even inexpensive! HAHAHAHAHAHAHAHAHA! Why do things the easy and cheap way, when you can spend hundreds on supplies to make them yourself with the hours and hours and hours of leisure time you don’t have because PLEASE SEE LENGTHY LIST OF HOBBIES, ABOVE! ANYWAY. That lengthy digression out of the way, then I poured the dreaming, well-rested dye into the crock pot, added cool water to make a tepid dye bath of the same temperature as the soak water (no shocking the yarn, please, that will come later when I wear the shawl over jeans, the incongruity of which would shock anybody let alone delicate hand-dyed Merino laceweight yarn that had White House aspirations), added white vinegar for my acid (to set color) and left out the salt (which levels the color) because I am a rebel that way and had high hopes of getting something like that Mahogany I got from Lisa at Stitches, with the various ‘layers’ that made up the final color coming through here and there. And then I did the laziest dye job, ever. Turned the crock pot to ‘high’ and walked away. Worked an hour, came downstairs and turned the yarn, worked another hour, turned the yarn, worked two more hours, collected Captain Adventure from the bus, noted the dye was exhausted (e.g., the water was clear), turned off the crock pot and ignored it overnight. About the point infatuation was really setting in (and I was contemplating larger dyeing vats and whether or not I could dye enough to make a whole sweater all in one go for dye-lot compatibility), I thought…oh crap. Because you know, seriously…this I need. Another obsessive hobby. Which undoubtedly has tools I will discover I can’t live without because this always happens. I’ll probably need…scales. And special thermometers. They’ll probably make a special pot with climate controlled everything where you can get a precise result so that if you wanted you could get a black-black-and-nothing-but-black dye lot of yarn. Gah. Why don’t I just go ahead and cut to the chase. Buy myself a yarn mill with dye vats the size of pickup trucks and get into the international wool market?! Send out an email to all the sheep farmers in California: Buying wool! Buying wool! Send me all 3,000 pounds, I’m that obsessive about it!! Oh well. All kidding aside, in terms of spending your life buzzing from one high to the next? I could be making worse choices. Sniffing freshly washed hand-dyed wool never got someone pulled over for being under the influence; riding a cuddle-high never put anybody in prison; hand-dipped candles aren’t illegal in any state that I know of, and of course, nobody is going to call the police because of the racket from my harp. Unless I hooked it and my microphone up to the old amplifier and started blasting Danny Boy at the top of my lungs for a couple hours in honor of St Patrick’s Day. I mean, there are limits. mmmm, that is lovely:) Not surprised you can see a whole new hobby there. Not that I'm an enabler or anything. Cut to the chase indeed: how much for one of those dyed skeins?? Looks just about perfect for the Ink-Spot I want to knit.... Hmmm: does that count as enabling?? Beautiful! Can't wait to see you wearing it. Oh yeah - dyeing. It be fun. I don't do it often but I LOVE it! And that yarn - WOW. Looking at it, you'd never know that you didn't have years of dyeing experience, classes, and fancy doohickeys. I think that colur is going to be gorgeous with jeans. 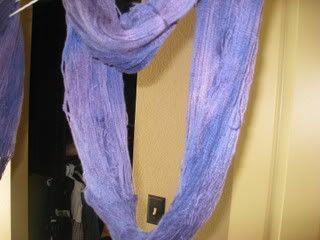 Dying yarn is a lot of fun and your "lazy" way turned out beautiful!! I do have a question though, you mentioned adding salt "levels the color". Does that mean it would come out all one shade? How much salt do you add? I haven't heard about that and I can't get my yarn to be consistantly one color when I want to! Oohhh...... Don't tempt me, Tama, please don't tempt me! Actually, I have a couple of questions re the dye-ing process: how much vinegar did you use as mordant? And how much salt would you suggest? DH has a beloved t-shirt that was deliberately "destressed" by the manufacturer and I want to stop it fading further.